Just a few days before LouFest 2018, the organizers cancelled the festival, leaving more than 30 local vendors and 60+ local musicians without a way to recoup their losses for the weekend. In just 24 hours, various businesses and local St. Louis boosters, myself among them, lept into action pairing vendors with places to sell their wares for the weekend. Bands were rescheduled at available venues however possible. I worked engage influencers and the general public. We were able to gain coverage with local media KMOV, KSDK, Riverfront Times, Sauce, and KTVI. The movement, handled almost entirely through social media took on #InLieuFest. 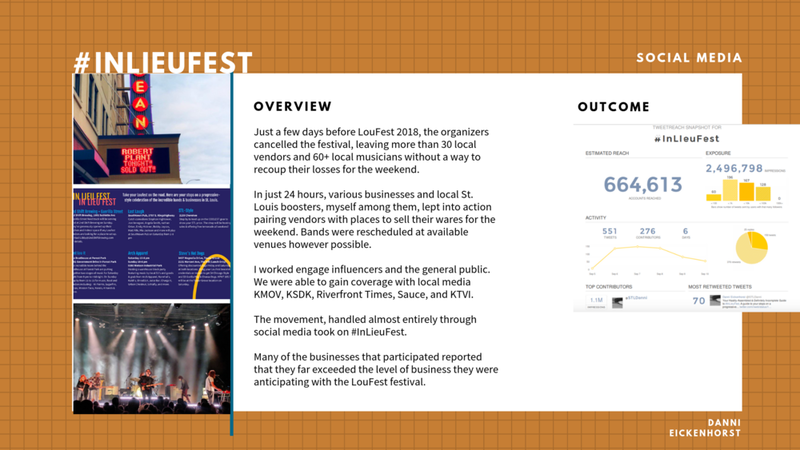 Many of the businesses that participated reported that they far exceeded the level of business they were anticipating with the LouFest festival.